Photography by Tara Rudolph; Tea towel by Jenny Pennywood, Mug, Bath Salts, And Notepad from Leif, everything else from Half Hitch Goods. 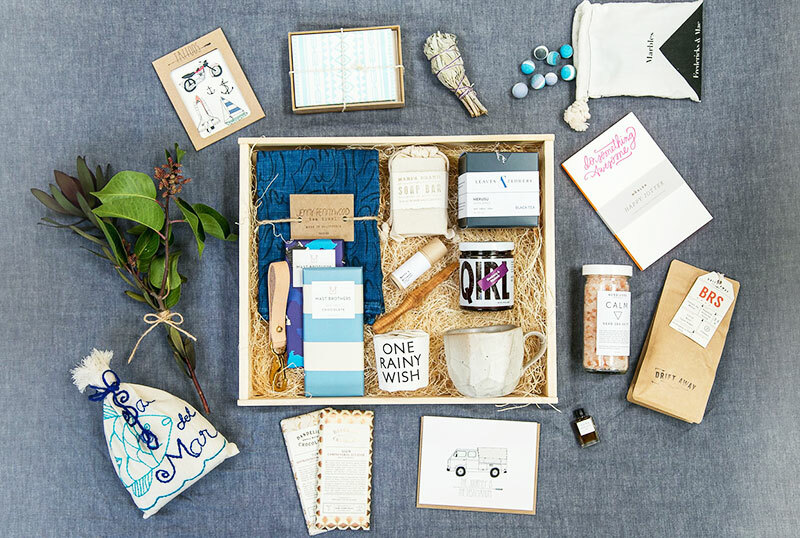 Sure, we love one big gift as much as anybody else, but there’s also something incredibly charming about receiving a carefully curated gift basket filled with tiny treasures. If you’ve been scrolling Instagram lately, you know this gifting trend has become huge in recent years, partly due to the beauties created by professional gifters (and mamas!) like Simone LeBlanc and Barrett Prendergast of Valley Brink Road. Of course, it’s not always feasible to order a gift basket created by these masters and others like them, but DIY-ing it is definitely a solution. Just follow our handy tips below, and go! –Think about the container. Do you have a basket or crate you never use? (Or even something a close friend could return later?) A big gift box (minus the top)? These metallic paper bags from Madewell are unique and come in gold or silver. Or you could grab some paper bags and DIY something (just make sure your creation is sturdy enough to hold what’s inside). –Think about your backdrop. Set your items on top of a bed of raffia, shredded paper, or a beautiful piece of fabric. –Mind your budget. Although your basket might be filled with lots of little items, the price tag can end up soaring if you don’t stick to a plan. We love sites like Half Hitch Goods, Leif, Brika, and Etsy, which all have affordable items (many under $25) perfect for bundling together. –DIY the snacks. To keep costs under control (and to further personalize your basket), try making a portion of the edible gifts. Got a killer granola, nuts, or green juice recipe? Mix it up and pour it into a cute glass jar. Voilà! –Utilize your grocery store. Who says gifts have to come from a fancy place? If you don’t have the time or will to make anything for the gift bag, head to your local grocery store and buy some of your personal favorites and style them with ribbons and wrapping paper for an upgraded effect. –Add the final touches. Adding a touch of floral or greenery to a gift basket will instantly elevate it. No need to go out and buy an entire bouquet. See what little sprigs and blooms you can forage around your local stomping grounds. Then, tie your basket with a ribbon, add a card, and you’re good to go.